It is time for the new adventure - the SEP adventure! Welcome to the wonderful world of the Student Exchange Programme (SEP)! All journeys have secret destinations of which the traveller is unaware. We live in a world that is full of beauty, charm, and adventure. There is no end to the adventures we can have if only we seek them with our eyes open. SEP will take you to unexplored places and offer you unique pharmacy practice in different fields in more than 60 countries. You will meet lifetime friends and share many exciting and unforgettable moments. What are you waiting for? Join SEP now! IPSF has member organizations in 88 countries worldwide. Check out which organizations offer Student Exchange Programme. 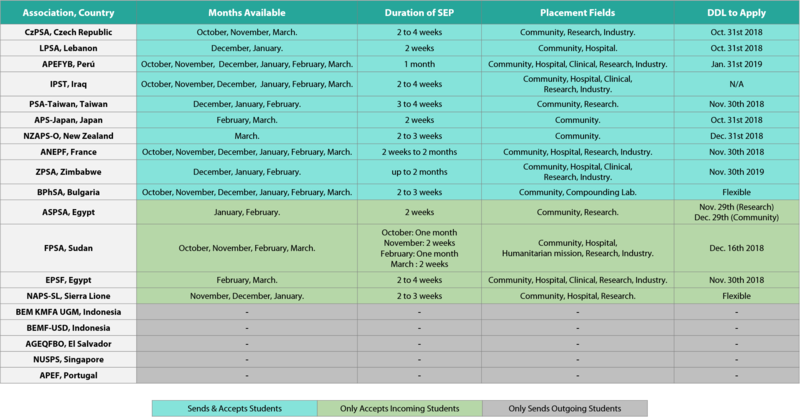 Student Exchange Programme (SEP) is IPSF's largest project, offering professional pharmacy internships. Every year, more than 900 students around the world are given the opportunity to experience the field of pharmacy in different countries. SEP podcast will cover a variety of topics about the IPSF Student Exchange Programme for pharmacy students and recent graduates.